Our Toddler program supports your child’s need for activity while building a foundation for future development. Children are guided in becoming independent and to have respect for themselves, others, and their environment. Toddlers are encouraged to let their adventures drive their learning experiences. Your child will enjoy our classroom designed just for them! The bright room, size and placement of furnishings, and availability of materials have been prepared with very young children in mind. Your child will be excited to explore a classroom where they can safely paint, sweep with miniature brooms, wash dishes, and play with materials that develop fine and gross motor coordination. It is here they can develop a love of learning! Your child will find a special place and new friends in our Toddler classroom community. Our program is distinguished by the way in which we approach your child with respect - from the first moments of each day when your child is greeted with a welcoming handshake to our daily support assisting your child in their natural drive toward self-sufficiency. Children who engage with their environment independently feel confident and capable as human beings. At this age, children are actively learning language, so its development is actively pursued. 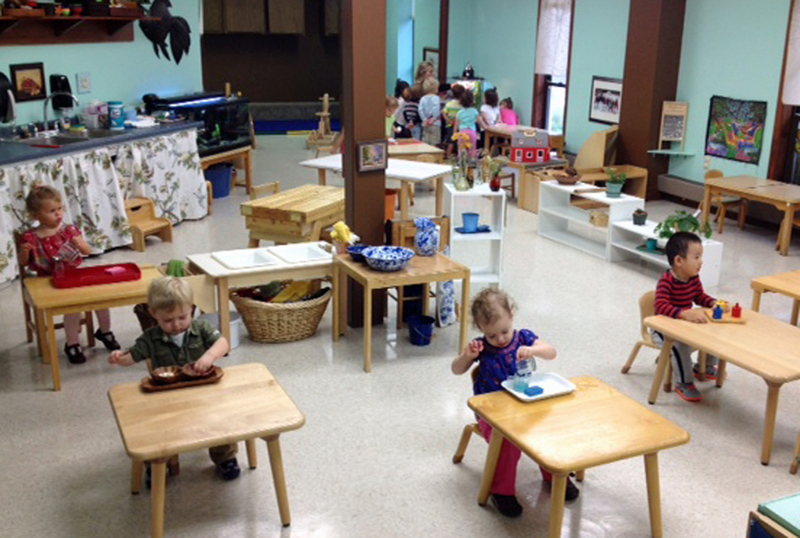 The Toddler classroom provides the ideal opportunity to support this amazing growth. Your child will be surrounded by rich and stimulating conversation. They will listen to stories, sing songs, and learn poems to nurture their budding language skills. The classroom materials and activities also offer many creative ways to support acquisition of new vocabulary which plants the seeds for reading, writing, and self-expression in the future. Young children are often heard to say “let me do it myself.” They are working toward independence in many areas including eating, dressing, and toileting. In our classroom, your child will be supported in learning to care for themselves and their environment through this growing interest in independence. Your child, like most Toddlers, probably has a lot of energy and is constantly in motion. Our classrooms provide children the opportunity to choose from a wide variety of activities that help use this energy to guide their development of motor skills and hand-eye coordination. Your child will have the opportunity to jump, climb, balance, crawl, sing, and dance. Your child can choose from such things as bead stringing, placing objects on pegs, puzzles, gluing, folding, etc. which all support hand-eye coordination. We have two Toddler classroom teachers who we call Directresses. They share responsibility for the teaching and care of all the children in the class. Both Directresses have Montessori Toddler training and many years of experience caring for young children. Sometime around the age of 3, your child will reach a number of key milestones. These include more rapid development of language skills, growing independence in self-care including toileting, longer periods of concentration, and interest in what is outside of the Toddler classroom. At this point, your child may be ready to move to the Primary Program for children ages of 3 to 6. If appropriate, we will contact you to discuss the process and provide an opportunity for your child to visit a Primary classroom and start the transition.